You can start using CareSay right now for free! You can engage with your service provider in real-time*. Get the care you need when you need it. Provide an immediate rating directly to the provider. Let your service provider know they're doing a great job. Ask your caregiver to improve the way they are serving you. Track all communication conveniently within the app. Let your concerns be heard instantly to your provider. 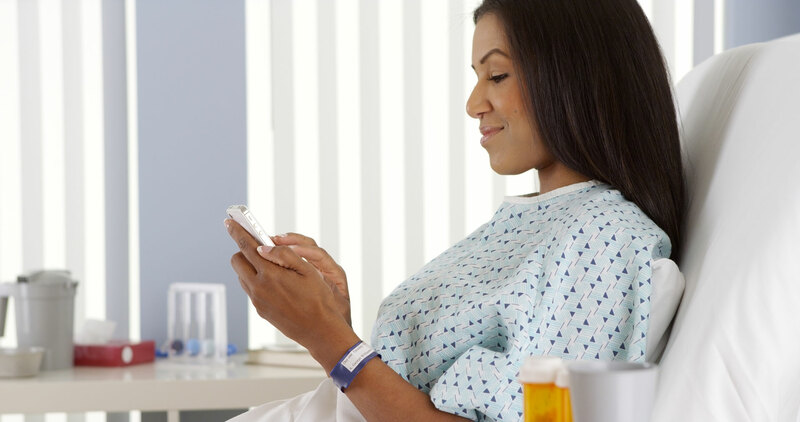 CareSay connects you directly to your healthcare provider and empowers you to communicate and interact in real-time*. Share a compliment about a caregiver who is providing you great healthcare. Submit a complaint or health concern and explain what you want to have happen. Send a detailed rating about the caregiver or organization you've experienced. Give direct immediate feedback to your caregiver and be heard. Here are four easy steps to start using CareSay today. Download the app free from either Google Play or Apple Store. Create an account quickly and gain access right away. Share your feedback, make comments and voice concerns. 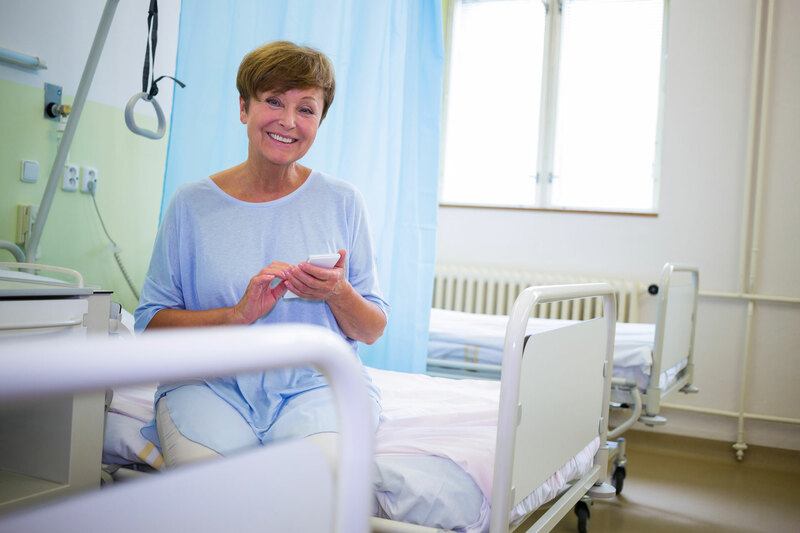 Get a real-time* response from your healthcare service provider. Are you a Healthcare Service Provider? We encourage you to sign up today to become directly connected to your patients and their well-being. Click on the appropriate icon below to download the CareSay app for Free right now. Sign up to our newsletter to hear about our latest developments and app updates. © 2019 Everyone's a Caregiver Learning Systems Ltd. All Rights Reserved. * Pending healthcare provider registration to the CareSay App. We take the privacy of our users seriously and are committed to safeguarding your personal information and PHI. 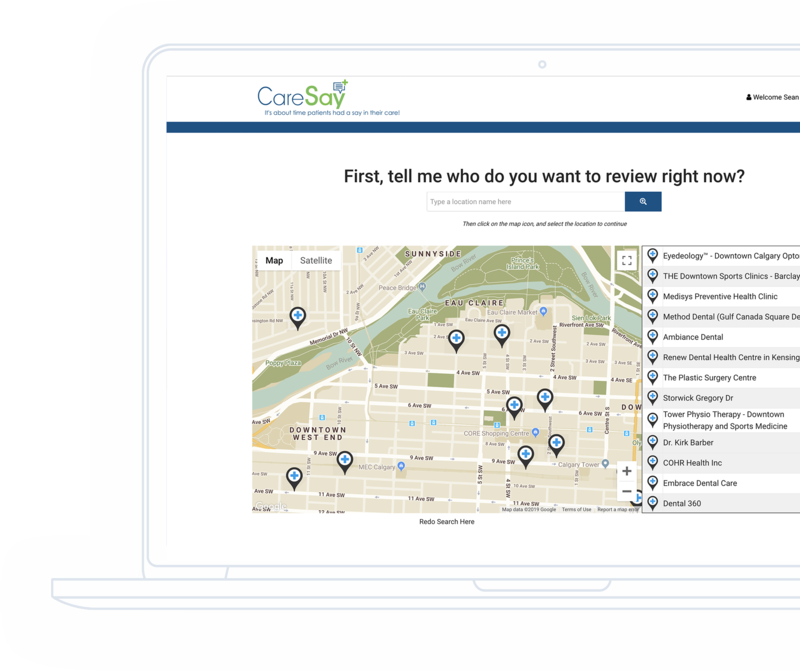 If you have any questions about the Policy or our privacy practices, please contact our Designated Privacy Contact with your questions at info@caresay.reviews. You have the right to access your patient record. If you request a copy of your record, it will be provided to you, and may be subject to a reasonable fee. You can request access to your record by contacting us at info@CareSay.reviews. If you want us to close your “EACLS” (CareSay) account, please send an email to info@CareSay.reviews. We will ensure it is done in a reasonable time after receiving the request. For billing purposes, we will notify your employer that your account is closed but not disclose the reason for the account closure. 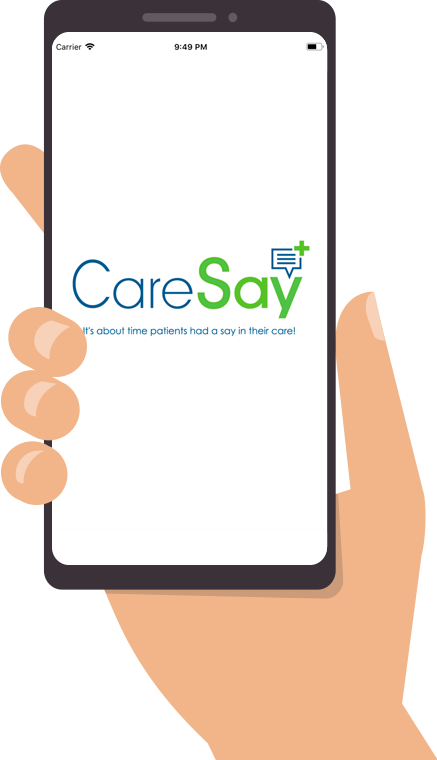 To ensure meaningful consent by patients, “EACLS” (CareSay) provides information about privacy practices in this Policy, as well as through our Designated Privacy Contact at info@CareSay.reviews. The contents of this website / software are protected by national and international copyright and other laws. Unauthorized storage, reproduction, transmission and/or distribution of the contents of this website / software, or any part of it, may result in civil and/or criminal proceedings. The copyright subsisting in the contents of this website is either owned by or licensed to “EACLS” (CareSay). You may retrieve and view that content on a personal computer, print individual pages on paper and store that content in electronic format for your own personal, non-commercial use. Except as set out above or as expressly agreed in writing with “EACLS” (CareSay) you may not reproduce, modify or in any way exploit (whether commercially or otherwise) any of the contents of this website / software. In particular, you may not: (i) sell or modify any of that content; (ii) remove or obscure any copyright and/or trade mark notice from any copies of that content made by you; and/or (iii) redistribute any of that content. This website / software does not grant to you any license or other right to use any of “EACLS’s” (CareSay) trademarks or trade names. All other product names referred to on this website / software may be trademarks or trade names of their respective owners. The extranet section of this website / software may only be accessed by you if you are an Authorized Partner of “EACLS” (CareSay). “EACLS” (CareSay) will issue you with login information to enable you to access that section of this website/software. Please ensure that you keep that login information secret. The extranet section of this website / software contains certain documents, images and graphics for download by you. If you are in any doubt as to whether or not you are licensed to download and use those documents, images and graphics or as to whether or not your proposed use of those documents, images and graphics is acceptable, please contact CareSay in the first instance. Every time you visit this website / software our web server automatically logs your IP address (if you are connected to the Internet you will automatically have an IP address. “255.255.255.255” is an example of an IP address), the type of operating system that your computer uses (for example, Microsoft Windows 10) and the type of web browser you are using to access this website / software (for example, Safari, Google Chrome, or Microsoft Internet Explorer). From that information the identity of your Internet service provider and the location from which you are accessing this website / software can be determined. “EACLS” (CareSay) ‘s web server also logs the IP address of the website / software you visited immediately before accessing this website / software. This website/software contains certain forms for you to complete to request further information from “EACLS” (CareSay), to request customer support or to give feedback. “EACLS” (CareSay) stores all of the information submitted by you on this website / software. This website/software also enables you to send e-mails to “EACLS” (CareSay). “EACLS” (CareSay) stores all such e-mails. CareSay uses transient “cookies” on this website / software. A “cookie” is a piece of software that is transferred from a website / software onto a computer’s hard drive that allows the website/software to gather certain information (such as the web pages viewed and the results of any searches conducted of the website / software). “EACLS” (CareSay) uses the information gathered by the transient “cookies” on the website / software to help you navigate through the website/software more easily. That information is automatically deleted if you close your web browser or leave the website / software for a sufficient period of time. Save as set out in this privacy statement or as permitted or required by applicable laws, “EACLS” (CareSay) will not disclose or share the information collected about you to third parties. “EACLS” (CareSay) reserves the right however to disclose or share information collected about you on or through the website / software to other companies within the CareSay, to suppliers of services to the “EACLS” (CareSay) or to government agencies (such as the police) or to courts of competent authority. BY SUBMITTING INFORMATION INTO THIS WEBSITE / SOFTWARE YOU EXPRESSLY AND EXPLICITLY CONSENT TO THOSE USES AND/OR TRANSFERS OF INFORMATION ABOUT YOU. If you do not consent to any of the uses and/or potential transfers of information about you set out in this privacy statement please do not submit any information into this website / software. All of the information “EACLS” (CareSay) collects about you is stored in industry-standard secure databases (which include password and firewalls). In addition, access to the information held on those databases is restricted to particular employees of “EACLS” (CareSay). You should note however that there is no such thing as a perfectly secure database. Please bear that in mind when entering information into this website/software. “EACLS” (CareSay) takes your privacy very seriously. The following privacy statement sets out, in relation to this website / software, what sort of information “EACLS” (CareSay) collects about you, how that information is collected, how “EACLS” (CareSay) uses that information, how “EACLS” (CareSay) protects that information, how that information can be corrected and/or updated and how you can ask “EACLS” (CareSay) to stop storing information about you. If you have any questions about this privacy statement or suspect that “EACLS” (CareSay) may have acted contrary to this privacy statement or any applicable privacy laws, please contact “EACLS” (CareSay) in the first instance. If you suspect that any information held by “EACLS” (CareSay) about you is incorrect, inaccurate or out of date, please contact “EACLS” (CareSay). When contacting “EACLS” (CareSay), please specify the information that you think is incorrect, inaccurate or out of date. Please also provide correct replacement information. If you wish to be removed from any of “EACLS” (CareSay) databases or mailing lists, please contact us at info@CareSay.reviews. If you would like to link your website / software to this website / software, please contact “EACLS” (CareSay). This website / software may from time to time contain links to third party website / software. Such links are provided by “EACLS” (CareSay) for your convenience and are not an endorsement by “EACLS” (CareSay) of such third-party website / software. “EACLS” (CareSay) does not accept responsibility for the content of third party website / software which are linked to this website / software. You access such third party website / software at your own risk. This website / software may, from time to time, contain certain statements or information with respect to: (i) the projection of the “EACLS” (CareSay) ‘s revenues, income, earnings per share, capital expenditures, dividends, “EACLS” (CareSay) structure, or other financial items; (ii) the plans, objectives and/or projections of the “EACLS” (CareSay) for future operations, including those relating to the products or services of “EACLS” (CareSay); (iii) the “EACLS” (CareSay) future economic performance; (iv) assumptions underlying or relating to any of the forgoing statements or information; and (v) any other projections, estimates or forward-looking statements. Such forward-looking statements are based upon, or will be based upon, “EACLS” (CareSay) ‘s judgment with respect to future events and are subject to a number of uncertainties and risks that could cause actual results or circumstances to differ materially from those expressed in the forward-looking statements. The “EACLS” (CareSay) wish to caution you that such forward-looking statements are only predictions and that actual events or results may differ materially. “EACLS” (CareSay) tries to ensure that the contents of this website / software are accurate and up-to-date. HOWEVER “EACLS” (CareSay) NEITHER MAKES NOR GIVES ANY EXPRESS WARRANTIES IN RESPECT OF THIS WEBSITE / SOFTWARE AND/OR ITS CONTENTS. IN PARTICULAR, THIS WEBSITE / SOFTWARE AND ITS CONTENTS ARE PROVIDED ON AN “AS IS”, “WITH ALL FAULTS” AND “AS AVAILABLE” BASIS AND “EACLS” (CareSay) NEITHER MAKES NOR GIVES ANY EXPRESS WARRANTIES THAT THIS WEBSITE / SOFTWARE WILL OPERATE IN AN ERROR FREE MANNER OR THAT THIS WEBSITE /SOFTWARE OR THE SERVER ON WHICH IT IS SITED ARE FREE FROM COMPUTER VIRUSES, TROJAN HORSES OR OTHER HARMFUL ITEMS (INCLUDING ANYTHING WHICH HAS CONTAMINATING OR DESTRUCTIVE PROPERTIES). TO THE FULLEST EXTENT PERMITTED BY APPLICABLE LAWS, “EACLS” (CareSay) DISCLAIMS ALL REPRESENTATIONS, WARRANTIES, CONDITIONS OR DUTIES OF EVERY NATURE (INCLUDING, WITHOUT LIMITATION, ANY EQUITABLE, COMMON LAW OR STATUTORY WARRANTIES, ANY IMPLIED WARRANTIES OF TITLE, FITNESS FOR A PARTICULAR PURPOSE, MERCHANTABILITY, SATISFACTORINESS, NON-INFRINGEMENT OF THIRD PARTY OR PROPRIETARY OR INTELLECTUAL PROPERTY RIGHTS, ANY WARRANTIES OR DUTIES REGARDING ACCURACY, TRUTHFULNESS, TIMELINESS, RELIABILITY, COMPLETENESS, PERFORMANCE, LACK OF NEGLIGENCE OR OF WORKMANLIKE EFFORT) IN RESPECT OF THIS WEBSITE / SOFTWARE OR ITS CONTENTS. ACCORDINGLY ALL SUCH REPRESENTATIONS, WARRANTIES, CONDITIONS OR DUTIES ARE EXCLUDED TO THE FULLEST EXTENT PERMITTED BY APPLICABLE LAWS. TO THE FULLEST EXTENT PERMITTED BY APPLICABLE LAWS, IN NO EVENT SHALL “EACLS” (CareSay) BE LIABLE TO YOU OR TO ANY THIRD PARTY FOR ANY LOSSES OR DAMAGES WHATSOEVER (INCLUDING, WITHOUT LIMITATION, DIRECT, INDIRECT, CONSEQUENTIAL OR SPECIAL LOSSES OR DAMAGES, DAMAGES FOR LOSS OF PROFITS OR OPPORTUNITY OR DATA OR OTHER INTANGIBLES OR FOR THE PROCUREMENT OF SUBSTITUTE GOODS OR SERVICES, DAMAGES FOR LOSS OF PRIVACY, DAMAGES FOR NEGLIGENCE OR FAILURE TO USE WORKMANLIKE EFFORT OR PUNITIVE DAMAGES) ARISING OUT OF OR RESULTING FROM OR RELATING TO ANY OF (I) YOUR RELIANCE ON, USE OF OR INABILITY TO USE THIS WEBSITE / SOFTWARE AND/OR ITS CONTENTS OR (II) THE PERFORMANCE OR NON-PERFORMANCE OF THIS WEBSITE / SOFTWARE OR (III) THE CONTENTS OF THIS WEBSITE / SOFTWARE EVEN IF “EACLS” (CareSay) OR ITS SUPPLIERS OR SUBSIDIARY COMPANIES HAVE BEEN ADVISED PREVIOUSLY OF THE POSSIBILITY OF SUCH LOSSES OR DAMAGES AND WHETHER SUCH LOSSES OR DAMAGES ARISE IN CONTRACT, DELICT, TORT, FOR NEGLIGENCE, UNDER STATUTE, AT COMMON LAW OR EQUITY OR OTHERWISE. This site and application are owned and operated by Everyone’s a Caregiver Learning Systems “EACLS” (“CareSay”) The information contained in this site is proprietary to “EACLS” (“CareSay”) and the modification and/or use of the materials for any purpose is a violation of “EACLS” (“CareSay”)’s proprietary rights. Unless specifically permitted by “EACLS” (“CareSay”) or as part of the permissions granted to use demonstration software as specifically described in the site, the materials may not be used, reproduced or disclosed to others. “EACLS” (“CareSay”) does not warrant the correctness or accuracy of the content contained herein. Under no circumstances shall “EACLS” (“CareSay”) be liable for any damages that result from the use of, or the inability to use, the software or other materials contained in this site. For further information on our disclaimer contact us at info@CareSay.reviews or contact our office 1-800-667-7325 ext. 206.